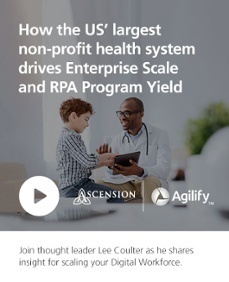 process automation, using Blue Prism’s technology, is providing operational efficiencies, incremental cost savings and higher levels of workforce productivity for Ascension. Software bots and other digital technologies deliver better transactional speed and accuracy, while working around the clock. This leaves more time for our employees to do what they do best, which is communicating, connecting and collaborating. When you’re expecting people to change the way that they work every 30, 60, 90 days, as new automation is being deployed, there is fear, uncertainty and doubt. You’re asking supervisors to now be accountable for the same work product, but they have four human FTEs and six digital FTEs- more than half of it is not being performed by people that they can talk to.